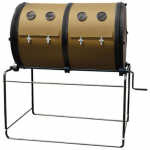 * Fast and easy for some gardens Compost tumbler bins get even better in design. Let's see how they meet your garden composting needs and take a look at the latest models. Claims for drum/ tumbler compost bins range from 'it doesn't work at all' to 'compost made in 14 days'. Both may be right - the difference depends on how you use them. So if you've never done composting before or only have small amounts of soggy kitchen waste, then consider using a worm bin detailed on this link. But if you're used to turning heaps but can't manage the effort anymore - then definitely consider one of the larger drums or compost tumblers mentioned below. And if you have loads of grass cuttings that you want to compost quickly then consider the Tumbler Composter in particular. From small compost bins for tiny gardens and for kitchen waste, to large compost drums for loads of garden waste and even more valuable compost made quickly. Basically compost tumblers / drums make turning, aerating and mixing the heap easy to do. This speeds decomposition. They are particularly well-used for composting batches of green matter and kitchen waste, but less valuable when adding woody or tough fibre which always takes longer. Tough stuff from your garden is best included after shredding. As soft green matter decomposes faster in compost tumblers it leaves behind an increasing amount of decay resistant fibres from garden waste. More greens can then be added, while taking care it doesn’to become soggy. The compost will be richer. You always need to balance greens with some high carbon brown stuff. Have paper, straw, used pet bedding (but no turds), shredded cardboard... handy to balance greens and help absorb excess moisture. Moulded bins with little ventilation produce internal condensation. Compost activator is recommended especially for compost drums and tumblers. It contain micro-organisms, nutrients, and enzymes, to get composting started. In America you can choose from a range of compost activators on this link. For U.K. gardeners - Biotal have created several compost activators for leaves, grass cuttings, and general garden waste click this link to try it. To get a job done quick, leave out any really tough garden waste. Some gardeners add worms to a mix, but please not until compost is cooling down. Better still - tip the stuff out to finish off in a static compost bin. TWO MAIN TYPES OF ROTATING COMPOST BINS EXPLAINED BELOW. Most of these have a relatively large airspace above the compost. Some gardeners with larger compost drums report that the contents readily dry out. My advice: don't overdo turning the handle. You only need about 1 or 2 revolutions every few days. For large composters drop in a plastic cover sheet between turns to reduce moisture loss. Some drum composters are mobile, others have stands that permit emptying straight into a bucket or barrow. Heat loss due to small size is reduced by insulated wall which reputedly keeps it going into colder months. Easy to turn without a handle. My kitchen waste is soggy - see keep in balance above. Find these Compost Drums here in U.S.A.
Can be wheeled like a barrow - large door makes dumping easy. Steady door on handle when loading. Most gardeners run short of garden compost appropriately known as 'black gold'. Even more lawn cuttings, weeds etc... get into this one. You won't be sorry you made bigger batches. Especially useful when you have a lot of growth to cut back at certain times. Use an excess of soft greens and some shredded browns. Drum is 27" above ground and empties straight into a barrow. Site in a sheltered spot. Take care to keep small children away from your compost drum - the handle and drum could be misused and exposed cogs are a risk to little fingers. (see covers) I’ve seen good feedback on customer service for the above. While the drum comes in the box – you need to put the ends on. 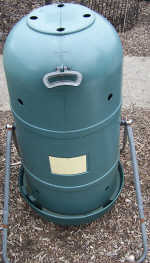 More details on Compost Drums available in America here. Mantis ComposT Twin 4000 - U.S.A.
For a gardener with a real garden. Many happy customers own one of these. 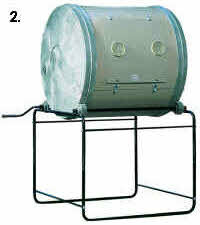 The Mantis Twin composter comes with its drum as flat metal sheets for self-assembly onto the ends (a 2 person job). A 20 bushel capacity for the Mantis Twin converts to 705 L for comparison. Here's a compost drum to concentrate your green waste into nutritious liquid fertilizer. It readily drains through 2 slits to collect in the base. Kitchen waste as well as annual weeds, dead plants, light prunings, 2 buckets of grass cuttings, plus brown leaves and paper should go well for starters. Add powdered compost activator, and comfrey leaves and nettles will help too. Also add a few trowel fulls of spent compost or good soil. The drum doesn't have internal paddles - too many grass cuttings and too frequent turning produces grassy balls. Keep hold of the small drainage hole caps in base for when you want to empty it through the spout. Position drum on base before filling. This is a highly versatile compost drum you can roll down the garden to fill or empty. Compost drums can also be used more generally for mixing bulk organic materials - sand, leaf mold, garden compost, organic fertilizers, sterilized loam - to make your own compost mixes for seeds, potting, and planting. Would you agree that compost heaps are not normally the sort thing you move around your garden. Good, because compost tumbler bins are mounted on frames and few permit mobility. But if you want to turn your grass cuttings into compost quickly then the tumbleweed is perhaps the one to go for. The Tumbleweed has a bar across the centre of the bin that breaks up thatch of grass cuttings as they are tossed over. It also has an opening lid at both ends. Tumbleweed Composter on this link - America . << This next compost tumbler I've illustrated for U.K. gardeners, clearly shows the grips on the side to help you turn the tumbler. You only need 1 or 2 turns every 5 days or so. Let the heap heat up in between time. Compost activator is recommended especially for composter tumblers. Activators contain micro-organisms, nutrients, and enzymes, to make a good start. In America you can choose from a range of compost activators on this link. For U.K. gardeners - Biotal have created several compost activators for for leaves, grass cuttings, and general garden waste click this link to try it. A water-proof vinyl cover accessory is available for protection when the Mantis 4000 is not in use, although it does not cover the handle. A compost sifter screen is available to replace the door of the Mantis 4000. This allows finer compost to be harvested for potting or seed sowing. The remaining course debris can be either left longer to decompose, harvested seperately for mulch, or taken out and recycled in the adjacent drum. Gardening Guides - Hundreds of articles about flower, vegetable & fruit gardening, garden design with tips & tricks.